Dendrobium kingianum is one of the most garden hardy orchids around. The Pink Rock Orchid comes from Australia. Ours have done well in the ground in well drained situations and in containers from the coast in Southern California to moderate sections of the interior valleys. Ours have survived winter temperatures into the low 20°s F. Dendrobium kingianum will do it's best in a shaded location with sharp drainage and at least weekly water. I usually plant them in bark, but Dendrobium kingianum will grow in the ground if it drains well enough. 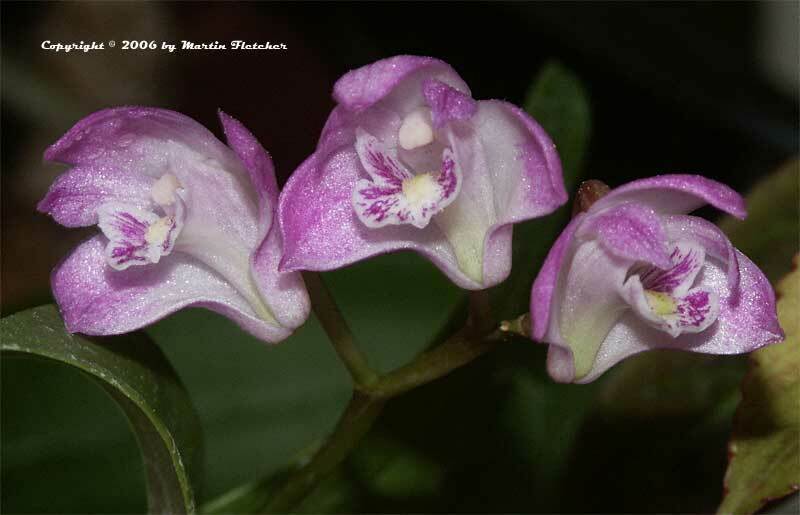 Flowers and foliage of Dendrobium kingianum - Pink Rock Orchid. High resolution photos are part of our garden image collection.